Mesha was the king of the Moabites who was forced to pay tribute to his neighbor, the Nation of Israel. The Bible tells us that this tribute suddenly stopped: "Mesha, king of Moab, rebelled against the king of Israel..." (2 Kings 3:5). 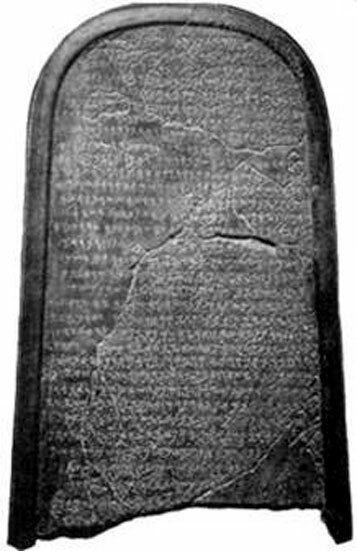 Mesha’s account of his rebellion against Israel is found on a large stone monument known as the Moabite Stone (Mesha Stele). The stone inscription was discovered by a German missionary in 1868 at Dibon (ancient Moab; present-day Jordan). The Moabite Stone is a dark-colored, basalt monument about four feet high by two feet wide, dating to the reign of King Mesha in about 850 B.C. This artifact is another important source that corroborates the biblical account of the early Israelites. It currently resides in the Louvre Museum, Paris.